The passing of Jack Atwood has revived memories of Atwood’s Department Store, which from the 1930s to the 1980s sold general merchandise in downtown Upland, at the northwest corner of Second Avenue and Ninth Street. The building later burned in a fire and was demolished. The lot sat empty for a decade until a very nice two-story retail and commercial structure plugged the gap a couple of years ago. At this point, that’s about all I know, although I’m hoping to write something in my column soon about the store. What can any of you tell us about Atwood’s — the store and the family? Before the Ray Davies concert in L.A. last week, I had dinner at Clifton’s Cafeteria a couple of blocks up Broadway from the Orpheum. 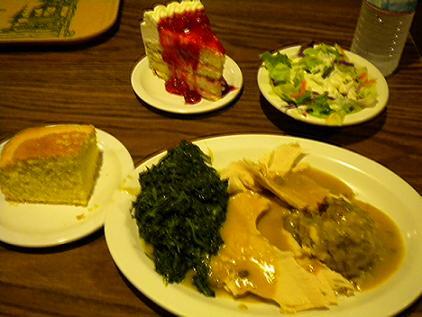 My meal was kind of Thanksgiving-y: hand-carved turkey, stuffing, cornbread, a tossed salad, spinach and a slice of strawberry-filled cake. If I’d known I was going to publish this photo on the holiday, I might’ve gotten the pumpkin pie. Happy Thanksgiving, and whatever you eat today, may it be at least as good as the food above. For Thanksgiving week, we’re going dark here on the blog, other than a special post Thursday for Thanksgiving Day. I’m taking a few days off (paid, this time) to relax and work on some projects at home. Columns will continue appearing, however; I was able to write a few ahead last week to clear out a backlog of items. Enjoy the week, poke around on the blog for past entries if you like, and we’ll see you next week. 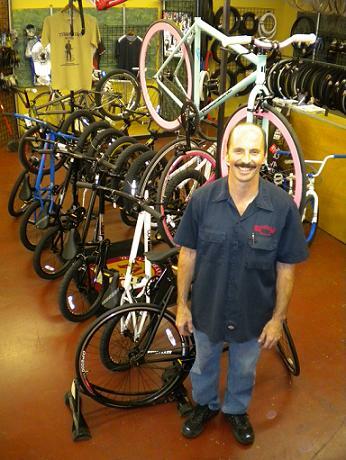 Today’s column is about Bumstead’s Bicycles, the Ontario bike shop with the funny name and the distinguished pedigree. Founded in 1909, the store is the city’s second-oldest business, after Graber Olive House. 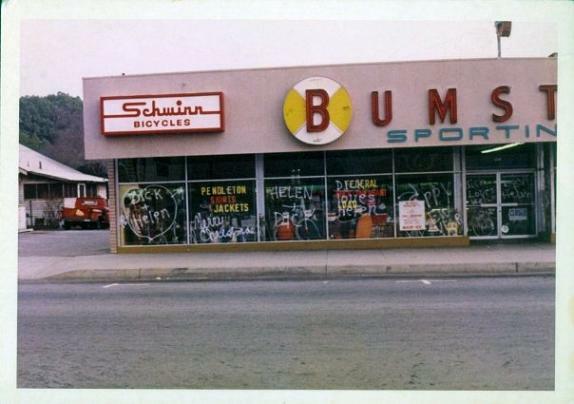 Bumstead’s is celebrating its centennial on Saturday with a 10 a.m. to evening party at the shop, 1038 W. 4th St. (at Mountain), and with a sale Dec. 4 to 6. They’d like old-time customers to stop by to say hello and reminisce. In the meantime, or if you can’t make it Saturday, how about reminiscing right here on my blog? Click “comments” to share your memories of the shop. The photo at left shows fourth-generation owner Lloyd Bumstead in his shop on Wednesday. He took the business over in 1986 at age 23. Below is a view of the 420 N. Lemon Ave. location circa 1960 when Bumstead’s sold sporting goods as well as bicycles. The store was on Lemon from 1960 to 1986 before its move to 4th Street. 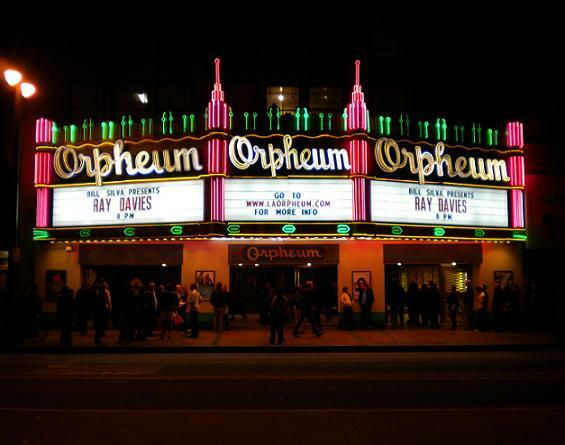 I went to the Orpheum in downtown L.A. on Saturday for a concert by Ray Davies, frontman of the Kinks. 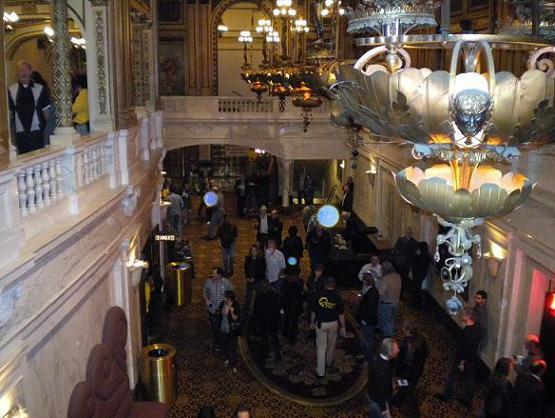 It was probably my fifth time at the Orpheum, now primarily used for concerts. As you can see, it’s a little like entering the Palace at Versailles. This was one of my favorite concerts ever. And the venue was no slouch either. Reader Susan Rose Fenske wrote recently from Brownsville, Ore., after finding my blog while searching for historical Pomona stuff. She attended Pomona High before graduating from Ganesha High in 1959. After her 50th high school reunion, she began thinking about times gone by. 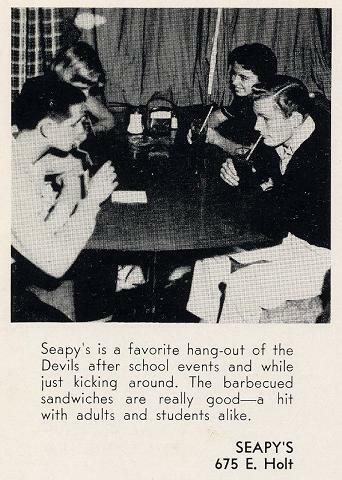 And those included Seapy’s, a restaurant on East Holt near the old Pomona High. 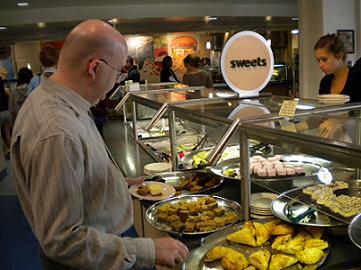 “I used to go here with my friends and order mashed potatoes and gravy and chocolate cream pie. 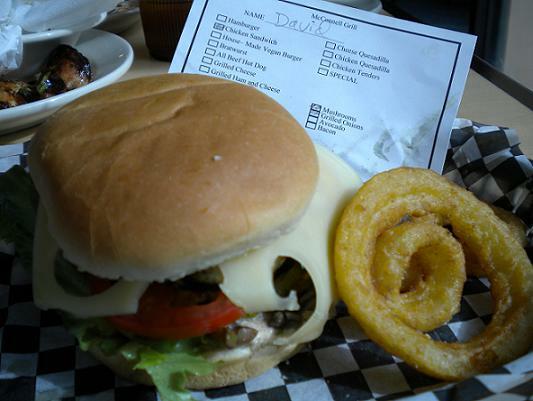 I loved those two things and ordered a la carte,” Fenske writes. Bruce Guter of the Pomona Public Library couldn’t find any photos of the restaurant but he did find the charming advertisement at left in the 1956 Pomona High yearbook. Here’s a link to the online slide show of 21 (!) photos of Pomona’s Masonic temple, the subject of last Friday’s column, shot by my colleague Jennifer Cappuccio Maher. The lodge was set to mark its meeting hall’s centennial with a rededication on Sunday. 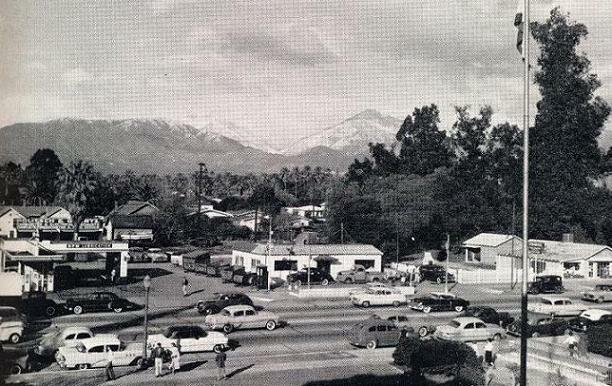 Here’s a view in 1955 of the north side of East Holt Avenue in Pomona, between Caswell and San Antonio avenues, photographed from the old Pomona High School. Can anyone identify the businesses visible across the street? The one at the left, and maybe the one in the middle, might be auto mechanics. The one at the upper right might be Seapy’s, a popular restaurant. But you’re the experts. Alas, the whole area depicted is today a vacant lot. (Sigh.) And the old Pomona High, which was gutted in a fire the next year, is now a shopping center with a 99 Cents Only store. Thanks to Allan Lagumbay of the Pomona Public Library for finding the photo in the 1955 Pomona High yearbook. WaBa Grill, 9670 Haven Ave. No. 104 (at 6th), Rancho Cucamonga; also 4110 Edison Ave., Chino; 9870 Sierra Ave., Fontana; 1055 W. Philadelphia St. and 800 S. Milliken Ave., Ontario. WaBa Grill is a new name to me, although as you can see above, it has four other Inland Valley locations, as well as others around SoCal. The Rancho location just opened in a new center next to Dickey’s BBQ just north of 4th Street. It’s a teriyaki bowl place, but one emphasizing the reputed healthfulness of the items: all-natural ingredients, no additives, no skin-on chicken, no oil and no frying. I had been wary after a sign in the window during construction promised, among other things, “vegitables.” Misspellings of core products aside, I gave WaBa a try earlier this week. I got the No. 2, the chicken plate ($6.99), with brown rather than white rice (80 cents more) and a soda ($1.60). The portion was filling, often an issue with chicken bowl places, and the food tasty. A small salad and orange slices come with. 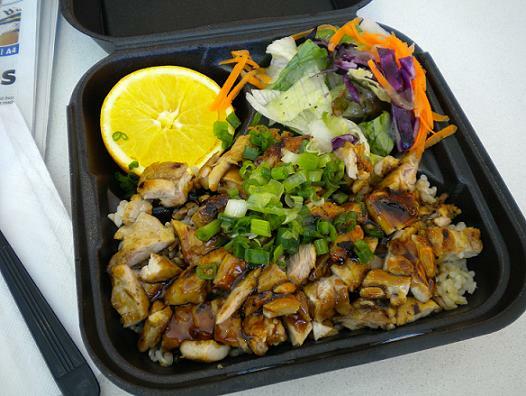 WaBa also has steak, salmon and veggie bowls and plates from $4.19 to $8.99. 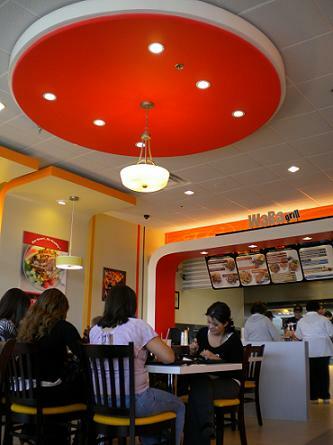 The interior is kind of cool, done in white, orange and red and with mod-ish wall treatments resembling giant brackets. It’s like Pinkberry with chicken. WaBa is a decent option if you’re in the area. And I am.